Muse Arts (a.k.a Sick Muse Art Projects) is a community arts organization that operates under the principles of inclusion and social justice. Working with community partners, Muse Arts create spaces for Emerging Artists from equity seeking groups to showcase their work, to access opportunities for professional development and to engage communities meaningfully and actively in hands-on, high quality arts education integrated to issues of Social Justice. Community Arts Developing art based projects for vulnerable populations, including new immigrants, refugees, and families who have experienced violence. Artivism and Public Education: Promoting social justice, equity and inclusion for all members of society. Support for emerging and newcomer artists in Toronto - The organization offers support to emerging artists from equity-seeking groups to showcase their work and to access exposure opportunities and professional development. International Cooperation: Artists locally and from different parts of the world engage in skill exchange and opportunities to support vulnerable communities , particularly communities impacted by violence and forced displacement. Community Arts Residence in Colombia : This Residence is a timely opportunity to bring artists interested in working and engaging communities, together to learn from local artists, communities and from each other. HAPPENING Multicultural Festival: is a four-day multidisciplinary festival that will engage more than 60 artists/performers who have self-identified as people of diverse communities, immigrants, newcomers and refugees. The festival features traditional and contemporary music, dance, visual arts, story-telling, poetry, crafts and food. 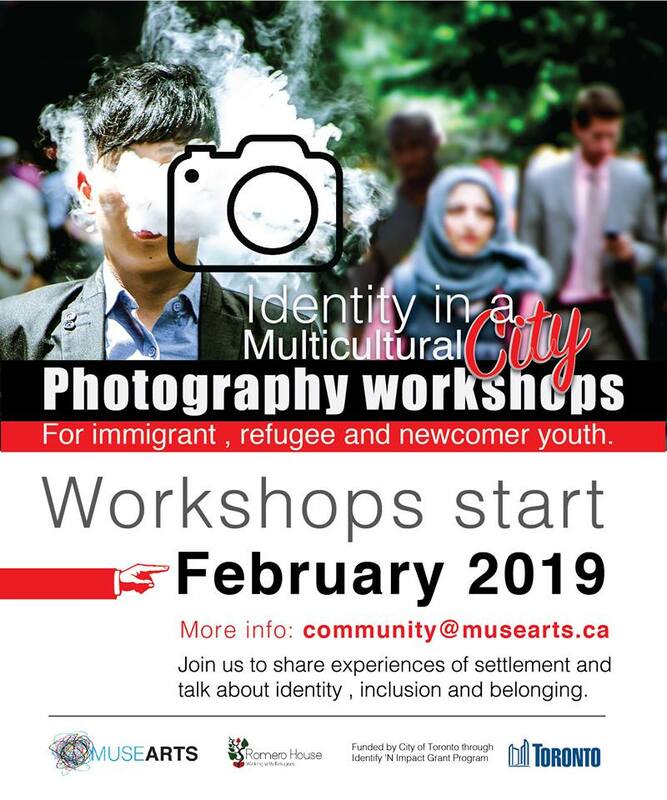 Anti-oppression training MUSE ARTS partners with arts and non-arts organizations to deliver workshops for artists and arts facilitators wanting to engage in practices that acknowledge and respect peoples individualities and identities. We engage artists in conversations that explore individual and systematic power . We believe that as artists supporting and working in communities we hold a social and civic responsibility to create safe spaces where all people have access to opportunities and to reach their potentials.